Located in Ontario, Canada, Algonquin College of Applied Arts and Technology was established in 1967. The College has undergone significant growth since its establishment, with nearly 20,000 full-time students and 35,000 registrations in its continuing education program. To support the student population, the Registrar’s Office receives approximately 2,500 transcript requests per term. The resulting influx of paper took up a lot of space, filling up file cabinets. Since transcripts need to be kept on file indefinitely, the paper couldn’t be reused. Over time, documents became discolored and frayed. In addition, paper forms would pile up on employees’ desks, resulting in processing delays. After struggling with a previous document management system that was limited to simply storing scanned documents, Algonquin College implemented Laserfiche enterprise content management (ECM) software to automate various processes within the Registrar’s Office. “Our Human Resources department was already using Laserfiche, and they provided positive feedback on the product. We found Laserfiche very easy to work with, which made it very easy for our staff to learn,” said Marie Theriault, Manager of Scheduling and System Support in the Algonquin College Registrar’s Office. The Registrar’s Office immediately started looking to use Laserfiche to improve the Credit Transfer (exemption request) process. With paper forms, students faced a long wait time to get approval or denial of their requests as paper forms were physically sent to multiple individuals for approval. Within four weeks of launching the automated process, the Registrar’s Office achieved a wait time of only 1 to 2 weeks in 90% of exemption requests submitted by students—down from 4 to 6 weeks. “This initiative was embraced by students from the start. It has given them back time so they can concentrate on their studies. Also, we are using technology that students use on a daily basis—they want to do everything online and this process has given them exactly that,” said Theriault. 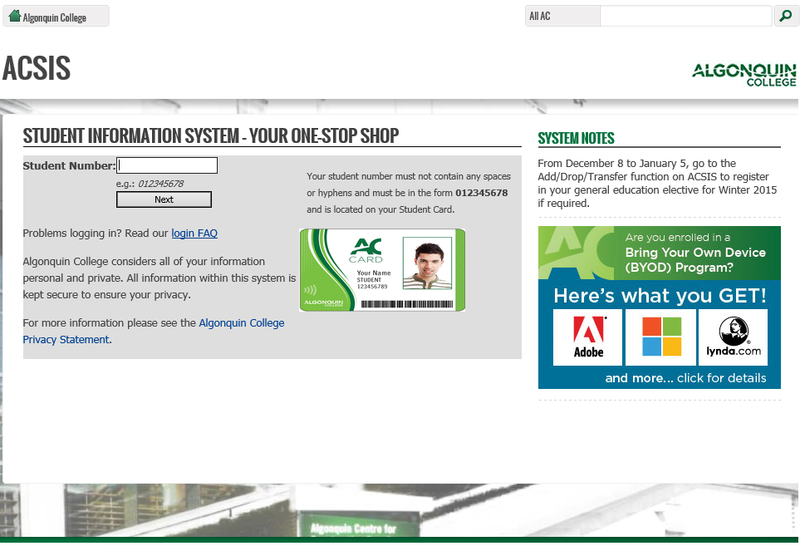 Here is how Algonquin College used Laserfiche to reduce the time to complete exemption requests by 83%. In the past, students would have to wait in line to request credit transfer exemptions, carrying all their physical documents with them. Lines would be very long, especially at the beginning of each term. This was a time-intensive process for students and created mountains of messy paperwork for administrators. Additionally, students could request multiples exemptions at the same time, resulting in long delays as students had to wait for all of their exemptions to be processed before receiving a response. Now, students can apply for credit transfer exemptions online through the student portal. They fill out an electronic form and upload supporting documents like transcripts and course outlines. Students fill out a separate form for each exemption request so that they don’t have to wait for all exemptions to be processed at once. 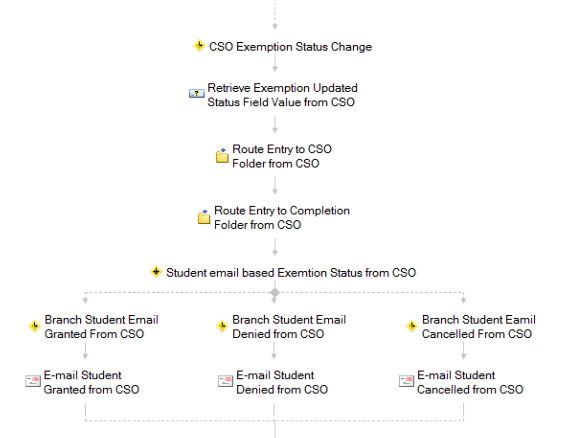 Laserfiche Workflow automates email notification and routing of exemption requests. From here, the RO can either process the request internally or forward it to the appropriate academic department (AD) for approval. If AD approval is needed, a member of the RO selects the appropriate coordinator from a dropdown list in the document’s metadata. Laserfiche Workflow automatically sends an email to this person, allowing them to review the document. When the coordinator either approves or denies the request, it is automatically sent to the department Chair for final review. This action triggers Laserfiche Workflow to send a final email to the student notifying them of the exemption approval or denial. The denial reason is included in the email sent to the student. Simultaneously, Workflow sends an email to the appropriate member of the RO, indicating that the external exemption needs to be added in the exemption database. 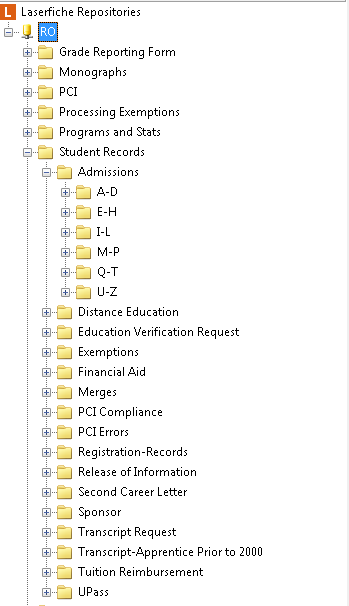 The request is moved out of the exemption directory and into the student directory section of the Laserfiche repository. Currently, transcripts are scanned into Laserfiche with Laserfiche Quick Fields, enabling information to be automatically added to the document as metadata. This metadata is then used to route and process the document using Laserfiche Workflow. 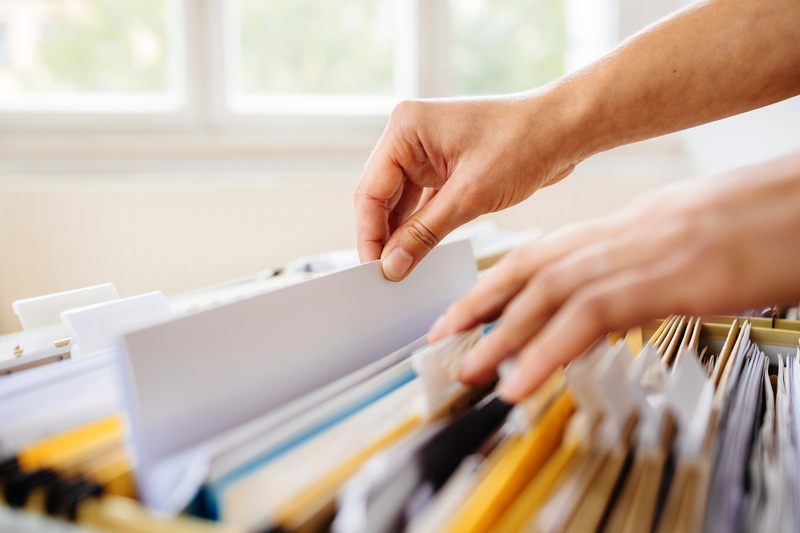 Instead of manually searching in filing cabinets for documents, employees at the college can perform a simple text search for the appropriate document, saving time. The paperless process has simplified the document request process, making it faster and easier than ever. “We measure the success of this initiative by the velocity we gained in our exemption process. The business impact is huge” said Theriault. Find solutions for your higher education challenges by downloading Quicker Better Safe Higher Education, a free step-by-step guide.